I noticed when watching the Waiting for Superman movie trailer (link) that it was made by the same people who made An Inconvenient Truth. Hard hitting documentaries that oversimplify complex issues and then hit you over the head with a baseball bat. Michelle Rhee promised to crash through and reform schools in Washington D.C. who were failing disadvantaged kids. She was given unconditional backing by Mayor Adrian Fenty. Fenty has now lost his bid for re-election, which was widely viewed as a referendum on Rhee. Diane Ravitch points out (Why Michelle Rhee and Adrian Fenty Lost) that Fenty was supported by white voters but lost the black vote. The media has blamed teacher unions but as Ravitch insists black voters can think for themselves. In her article Ravitch links to a Phi Delta Kappa/Gallup poll which shows that the Obama / Arne Duncan policies on school reform, which include elements of the Rhee approach such as sacking Principals in schools which are judged to be failing, are losing favour. You also don't learn that in the Finnish education system, much cited in the film as the best in the world, teachers are—gasp!—unionized and granted tenure, and families benefit from a cradle-to-grave social welfare system that includes universal daycare, preschool and healthcare, all of which are proven to help children achieve better results at school. In other words, Waiting for Superman is a moving but vastly oversimplified brief on American educational inequality. Nevertheless, it has been greeted by rapturous reviews. I think Ravitch approaches the issue of school reform honestly, so I think her comments reflect a genuine POV that is not fashioned to support one special interest or another. From what I have heard from Rhee in the past, Ravitch's description of what Rhee preferred is largely accurate. What Ravitch doesn't say (probably just an error of omission) is that Rhee was not opposed to dialogue with the teachers union. Note Ravitch says the *media" blamed them for the mayor's loss. Every time Rhee was asked if the teachers union was one of her enemies, she would say no. She sought to engage the unions in her reform efforts. She said in the past they had been a positive ally for change. She said her main obstacle that needed to be cleared out of the way was the school board. She said in her past efforts the school board always ran interference for the status quo, and made her reform efforts impossible. She also described how the superintendent, the school board, and the teachers union typically formed an "iron triangle" (this configuration is well known in political science) that makes change impossible. Basically what she was saying was that in order to bring about change, the dynamic between these institutions needed to change. That was her thesis, anyway. In the case of Wash., D.C. the school board was disbanded by the mayor (at least that's what I remember from Rhee's account). Even if her methods were not constructive, her account of what was going on before she came along was shocking. She told of schools where often most of the teachers didn't show up for work, and so the teachers that were there tried their best to sub for the ones who were absent. She told the story of a Teach For America teacher who would meet after school with kids at McDonalds to teach what they should've gotten during the school day. She talked about students who approached *her* saying, "This is what we need," and they were frustrated that none of the adults raised these concerns for them. To hear Rhee tell it, just basic, common sense sort of stuff was not happening. It sounded like pure unadulterated neglect. It sounded like *anything* would've been better than what was (not) happening. I agree with Ravitch, assuming her account of the reporting on the election is accurate, that the news outlets ignored the real story, that a majority of people just didn't like Rhee's methods. Hopefully some people with better solutions will come along. Some time ago I read Wendy Kopp's (Teach for America founder) book and blogged a review here: wendy kopp's book. The TFA approach is based on highly committed, high ability people being recruited for just a few years and then devoting themselves 100% to the needs of disadvantaged kids - and then moving on to something else before they are burnt out. This approach has its place - and I support the way Noel Pearson has implemented a modified version of it in Cape York - but clearly it won't and can't scale to the whole of education. We can't reasonably expect normal teachers to give up their lives totally to fix up individuals who have been let down by the whole social system through bad parenting, lack of early intervention etc. Teacher's have a right to a life just as Disadvantaged kids have a right to a life. 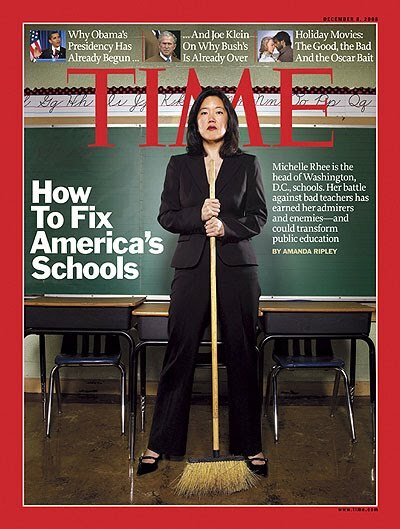 I read in wikipedia that Michelle Rhee taught for 3 years as a TFA recruit ("According to her resume, over a two-year period she moved students scoring on average at the 13th percentile on national standardized tests to 90 percent of students scoring at the 90th percentile or higher"). Then she moved on to become a school administrator and in effect demanded that other teachers do for all their careers what she achieved over three years. But we don't demand that all other professionals like doctors or nurses work around the clock for the benefit of their patients. Although it is true in my personal experience that some outstanding doctors do that, at least for some of the time. Those individuals should be respected and praised for their effort and dedication. But my general point still stands. The system creates problems as a whole. It is not reasonable that all the responsibility for fixing those problems falls onto one professional group. I'm not clear if this has changed with time, but the old expectations about documentaries are no longer valid. My memory is it used to be the expectation that a documentary format film was more like a long form news piece, or feature piece, where the important arguments about an issue were discussed more fully than could be discussed in a piece on TV. With some rare exceptions now, IMO, documentaries are visual essays, more often than not. At the extreme end of the spectrum are Michael Moore's films, which entirely divorce themselves from the old expectations. I'd categorize his stuff as "fact-tion" (in effect, fiction weaved from live action footage, but presented in a documentary format). The problem is that since they're not formatted in a way that would indicate that "these are just some ideas in the producer's head," people tend to come away believing they've seen the full story, when unfortunately they haven't. So I've found it prudent to approach documentaries with a good dose of skepticism. One of the consequences is I don't watch that many of them anymore, just because if I'm going to spend my time watching something like that I'd rather it run the gamut than be subject to proselytizing. My mind has changed about what is commonly known as "high standards", and standardized testing. I don't know what would be better, but I've been exploring some ideas. Okay. I didn't know about the connection between Rhee and TFA. The thing that Rhee was really passionate about, that I could tell in the interviews I saw with her, was the idea that the public school system was supposed to be "the great equalizer." It shouldn't matter what your background is. You can get a good education and succeed in life, just as the more fortunate can. I ran this by my mother, who was at one time a Montessori teacher, and who I think instilled in me my interest in education, and she said, "I was hearing that when I was going through Ed. school. It's never worked out that way." I think it really depends on the circumstances of individuals. There are many cases where people of modest means have been able to get a great education, but as Ravitch indicates, there are a bunch of factors that have to come into play for that to happen. Good teachers are not the only ingredient. I agree with her criticism of teacher accountability measures. Sure, accountability needs to be a part of the mix in terms of getting rid of bad teachers, but this standardization approach is based on some bad theories about theories! I got a real sense of what you're talking about with TFA when I read this article in City Journal from 2003. It shows a Yale graduate brimming with optimism about getting involved with TFA, thinking of all the wonderful things he can teach these children. His hopes are dashed immediately when he gets to the school. Not only is it so unruly that he ends up having to toss away many of his ideas, but when he tries to create a more orderly atmosphere, he gets reprimanded and investigated for it. Ultimately he got sued by a parent, using some alleged policy violation as a ruse to get money out of him. All the while the advice he was getting from the TFA program was, "Hang in there!" At the end I felt so sympathetic for the guy. It makes me wonder why anybody would expose themselves to this. The reality in his case was that everybody around him was enabling the dysfunction. I guess this was a worst case scenario. From the stats about TFA it sounds like there have been some successes, but the turnover rate tells the tale about how those efforts wear out the teachers. In the final analysis, despite the passion of people like Rhee, the education system cannot be the "savior" of the community. If it's going to succeed in educating, the community has to support its efforts.